Every Time a Bell Rings . . .
December arrived and with it came the Christmas Movie Marathon event hosted in Fisher Pub at Howlands. I had an essay to write, but when I saw that Miracle on 34th Street and It’s a Wonderful Like were on the bill, I decided to procrastinate like any good graduate student. At 2:00 I headed over and found a place on one of the sofas. I was desperately hoping for the original Miracle but unfortunately it was the remake. I stayed anyway and had a nice chat with Jack, a Londoner working on a degree in politics. 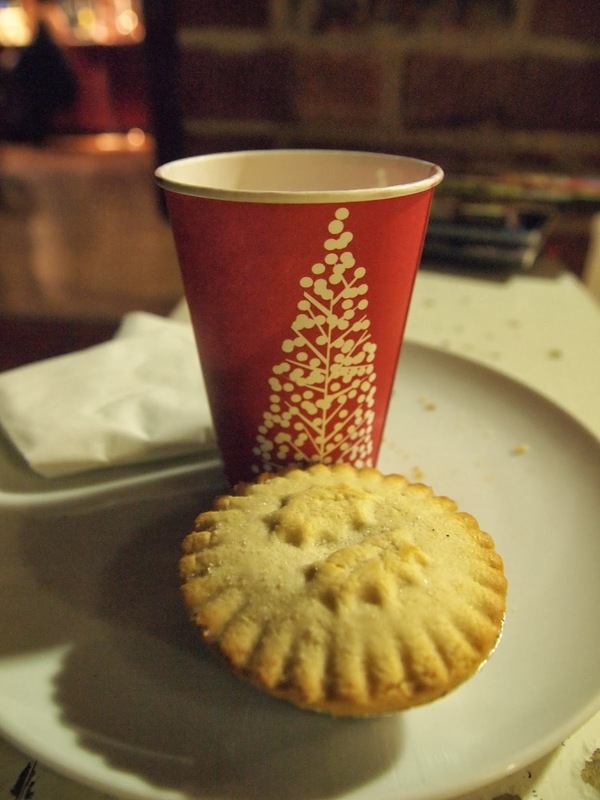 Free mulled wine was passed around and I finally tried my first mince pie ever. So I had no idea that mince pies were vegetarian. For some reason (I guess the word mince being associated with mincemeat in my head) I didn’t think it was something I could have. When I learned that it was a fruit filled pastry though, I indulged my curiosity and my taste buds. I have to say the taste was…interesting. It was a raisiny kind of flavour and I wasn’t entirely sure if I liked it or not. I decided further testing would be needed at a later date. Home Alone came on next. I got up to have a sandwich and as a result lost the comfy seat on the sofa. It was alright though because Trish had come in. I hadn’t seen much of her since September; her course was keeping her so busy. We both confessed some of our disappointments and realisations about graduate school. “I feel the same,” Trish said shaking her head. We talked briefly before she headed back to her flat to work on a few assignments. Finally it was time for It’s a Wonderful Life. I found a rather stiff chair closer to the screen. This was a film of my childhood. I remembered sitting by the fire when I was young and hearing Jimmy Stewart and Donna Reed harmonising “Buffalo Gals.” I never understood the film when I was young, but then a child wouldn’t. It wasn’t until I was older, college aged even that the story began to make sense to me. Sitting in a pub in northeast England, sipping a mulled wine, I found something new in the film I hadn’t noticed before. The movie should have been about Harry Bailey. He was dashing Joe College who shot down all of those planes in the war saving the lives of all the men on the transport ship. That is the type of story we most often see in films, well blockbuster Hollywood films, we’ll say. Here though, he is one of the most minor characters. It’s the story of a frustrated, average guy who never makes it past the boundaries of Bedford Falls; it’s the story of a boring, average life that is somehow at the same time, wonderful. Now some of you are probably wondering how it took me thirty years to realise this, it probably is obvious to everyone else, but I’ll admit, I never properly focused on this film before. I never actual sat and really watched and thought about it. I began to think about versions of A Christmas Carol, too. It’s such a similar story type: the ruminations on the past, the parade of cause and effect, the realisation at the climax that transforms the main character. So many Christmas movies are about examining one’s life, one’s contributions, one’s expectations, and one’s realities. Is it because Christmas is at the end of the calendar year, and as a result it is the time to reflect or is there an inherent reflectiveness about the holiday? It’s probably a bit of both. I was still thinking about the movie on the way back to my room. I had intended to stay for the next two films, but I was exhausted, despite it only being 7:30 pm. I knew I needed to rest because Monday was going to be a long day and I had a choir to conduct.